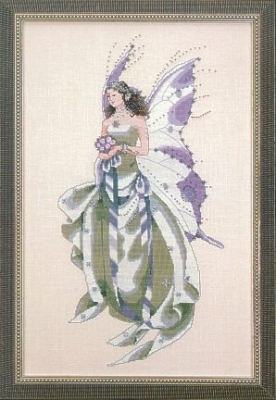 Fourth in Nora Corbett’s “Year of the Fairies” Collection, July’s Amethyst Fairy captures a radiant fairy mere moments before she is to meet with her long-awaited fairy prince. Because even enchanted glens get warm in July, her shadow-hued gown is off-the-shoulder satin, accented with precious gems the color of the midsummer sky. Her bouquet? Rarest lavender roses. And behind her, airy wings flutter majestically, shimmering with violet amethysts – amethysts as perfect as this moment. 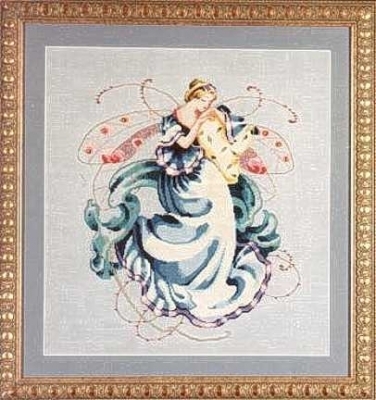 Stitched on 32 count Cream Linen by Zweigart. Alternate fabric, 32 count White Linen by Wichelt Imports. 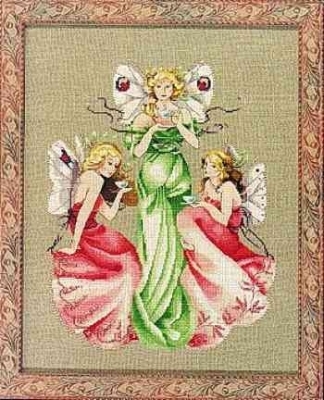 Stitched area is 9½" x 18½" with a stitch count of 149 x 295. 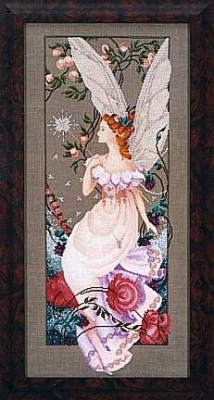 The third in Mirabilia’s “Year of the Fairies Collection”. She stands surrounded by wild strawberries, gazing into an emerald Crystal Treasure that signifies love. Stitched on 32 count Zweigart Belfast Cream linen by Wichelt Imports. Stitched area is 10 1/2"x 15 1/2" with a stitch count of 162 x 248. Stitched (2 over 2). DMC floss used. 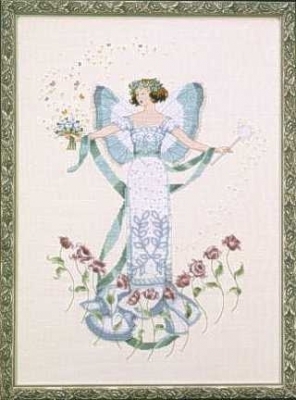 Second in Nora Corbett’s “Year of the Fairies” Collection, June’s Pearl Fairy is a celebration of soft summer sunlight. 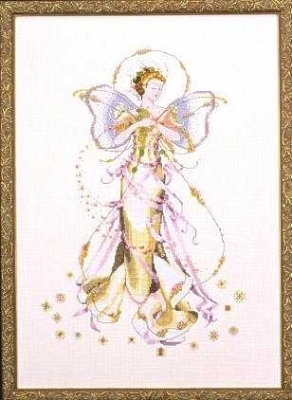 Awash in tiny pastel pearls, >from the tips of her iridescent wings to the hem of her gold gown, she is caught in a contemplative dance. Swirling ribbons of pink satin and seed pearls float gracefully around her as she steps lightly across a carpet of wild flowers. 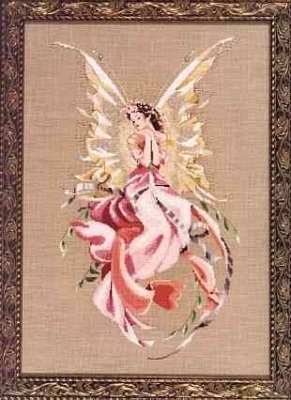 Stitched on 32 count White Linen by Wichelt Imports. Alternate fabric is 32 count Zweigart Belfast Antique White Linen. Stitched area is 11 ¹" x 16 ²" with a stitch count of 177 x 265. Victorian designs, her demure gown is overlaid with exquisite “blue diamond” beading, accented with a crown of flowers and pearls. Stitched area is 12.25" w x 16.75" h with a stitch count of 195 x 268. Stitched 2 over 2. Formed of colors only found in mystical glades, or in Nora Corbett’s watercolor palette, this sleepy beauty snuggles into slumber, ivory arms wrapped around a golden, jewel-tasseled pillow. Awash in shades of shell, coral, celadon and evening blue (with touches of fairy dust, of course), she’ll drift off happily in any wood-paneled music room, softly lit hallway, or elegant bedchamber. Remember, stitch quietly. Stitched on 32 count Permin Bonnie Blue Linen supplied by Wichelt Imports. Alternate fabric is 32 count Zweigart Belfast Confederate Gray Linen. Stitched area is 11 3/4" x 14 1/4 " with a stitch count of 187 x 225. Stitched on 32 count Chestnut Linen by Permin supplied by Wichelt Imports. Alternate Fabric is 32 count Zweigart Belfast Sand Linen. Stitched (2 over 2). DMC floss used. Blends are one strand each. Design area is 11" x 18" with a stitch count of 165 x 279. Unlike many of us in the workaday world, these three lovely enchanted beings haven’t forgotten the importance of the quiet reflection and gentle conversation that comes with taking tea. At a quarter of three, with hair let down, stately gowns and mother-of-pearl cups in hand, they remind us all that there’s nothing quite like a spot of tea for setting the world to rights. Stitched on 32 count Natural Linen by Permin supplied by Wichelt Imports. Alternate Fabric is Zweigart 32 count Raw Belfast Linen®. Stitched (2 over 2). DMC floss used. Blends are one strand each. Design area is 12" x 14" with a stitch count of 168 x 222. Behold! ‘Tis but a fair wood sprite perched upon a mossy branch in the misty gloaming of a midsummer’s eve! From her periwinkle crown to her sweeping purple satin hem to the iridescent span of her swallow-tailed wings, she’s scarce bigger than a lightening bug. But lest she fool you by her tiny size, remember well her magical powers. 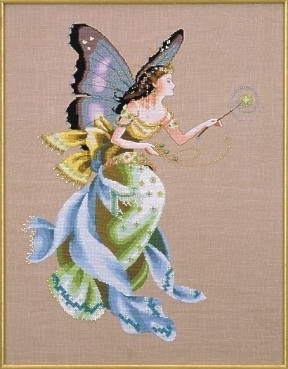 Save the stitching of her enchanted glowing wand for last, then watch as she casts her mystical spell over all who pass close by. Stitched on 32 count Stony Point linen from Wichelt Imports. Design area is 10 ¸" x 17 ¹" with a stitch count of 168 x 273. 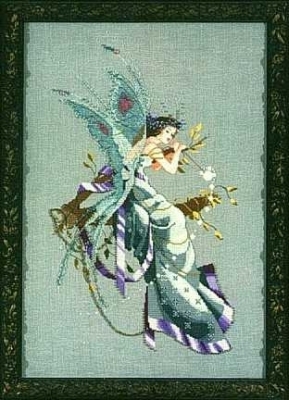 Sprightly and lithe, the tiniest of forest fairies flits among dew-covered flowers and berries. 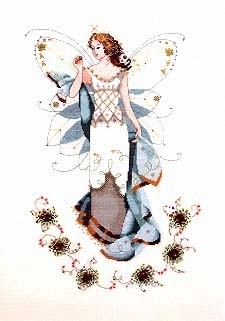 Barely bigger than a blossom herself, her dress is fashioned from fresh lavender petals, her wings from silvery cobweb silk, and her magic wand from a single falling star. Take care or you’re sure to fall under her magical spell with the first turn of your needle. Stitched on 32 count Barnwood Linen By Wichelt Imports (2 over 2). Design area is 8 x 20 inches. Stitch count is 126 x 320. DMC floss used.